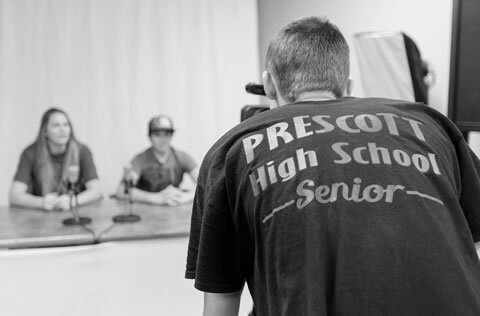 At Prescott High School, we are committed to flexibility for students where a need exists. This is the reason we have invested in a strong, multi-faceted online program. The PUSD Governing Board has set a requirement that one credit toward graduation be completed in an online class. The majority of students will complete one credit of elective classes through our PHS Online offerings. Students who have failed or lost credit in a class due to excessive absences. Students who have transferred from another school, who have missed a class that is required for PHS graduation. Students who are working with their academic advisor to plan for early graduation. Students who can document that they have employment that requires working during part of each school day. Students who, in addition to core classes, desire to take more electives than can fit in a 6- or 7-class schedule. Students who are involved in off-campus programs, such as Career and Technical Education classes, Yavapai College classes, or ERAU classes. Students who want to attend only part of a school day so they can go home early. Students who want to take online courses because they feel these are less rigorous than in-person classes. Students saying they are not interested in the subject matter. For the 2019-2020 school year, we will continue to accommodate each of the unusual situations in the first 6 bullet points above. Students work with their academic advisors to schedule any non-elective online classes in these instances. For situations where a student simply wishes to go home early or take a “core” class in a format they think is “easier,” the standard at PHS is for students to take all core classes in person. English, math, science, social studies, and foreign language classes taken at PHS for credit toward graduation will be taken in person with one of our certified teachers (except in the unusual situations covered in the first 6 bullet points). Because many seniors are on track to graduate with minimum required credits, some prefer to schedule only a partial day their senior year. As a consequence of too many desired classes being scheduled during the same school periods, students are forced to make difficult choices. Some seniors may find that their hope to leave at lunchtime will still work for them. Other seniors may find that arriving at school for 2nd or 3rd hour and staying through the end of the day works best for them.